Premiata Forneria Marconi (or PFM) were the first Italian progressive rock act to gain a following in the US and England. 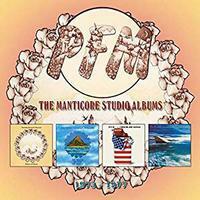 This new four CD box set compiles their four albums that were released on Manticore between 1973 and 1977. It's a quality product, all enclosed in a nice clam-shell box. Each CD comes in a miniature gatefold LP cover. Additionally, there is a nice booklet that folds out into a poster. The band's sound definitely changes from album to album, while still retaining a certain consistency at the same time. While they had their own sound, at various times they call to mind acts as diverse as Emerson, Lake and Palmer, Nektar, Genesis, Frank Zappa, King Crimson and more. If you want to catch up on a classy slice of PFM's musical history with one purchase, look no further. This is a great item. Acoustic guitar brings this number into being and holds it for a time. Eventually other instruments join and bring more of a classical music meets folk prog approach. This is intricate and quite pretty. Then after the one-minute mark it shifts to a bit that's slightly weird. That transition section doesn't last long, though. They fire out into some smoking hot progressive jamming from there. That section works through. Then this drops down to just vocals as a folk music styled section emerges. Folk prog is the order of business and this isn't far removed from some of the melodic early King Crimson. Multiple layers of vocals are a nice touch. Around the three-minute mark this rises upward into a more powerful (but still melodic) progressive rock movement. We're taken out from there into a playful kind of excursion that again makes me think a bit of early Crimson. The cut keeps evolving from there in a powerful and rather lush progressive rock arrangement. This is both classic and classy. A fast-paced hard rocking jam is on the menu here. This has some great synthesizer work and powerhouse shifts and changes. It sounds a bit like ELP, but still there are different flavors here. The sea of vocals chorus works well. It works to a mellower movement that is rather balladic. Then it intensifies before working to a delicate jam for a short interlude. The cut drives forward from there in a powerhouse prog jam. A short quirky section is heard at the end. There is a dramatic kind of trippy texture to this number. It has hints of AOR progressive rock and psychedelia in the mix. Yet it also has more traditional prog here. There are shifts and changes. The balance between mellower and more powered up is classic. I dig the driving jam around the two-minute mark. Don't get used to it, though, because nothing stays long, and that gives way to a full classical break that eventually evolves into driving powerhouse prog from there. The synthesizer based section later is cool, and the cut drops downward to mellow stuff from there. It rebuilds for a short instrumental outro. Acoustic guitar starts this piece. As piano joins, this has a real jazz-like sound. That gives way to something that features a violin and feels more classical. Still, there is a bit of a jazz trio vibe along with some hints of Rock In Opposition. This musical exploration gets quite jazz oriented as it continues through various sections along the road. Flute rises up later to bring a lightness to it all. This instrumental is classy. Acoustic guitar brings this into being. The lyrics on this one are in Italian. The song is pretty and has a lot of folk music built into it. It powers out into more rocking stuff around the one minute mark. The jam around the three-minute mark features some killer keyboard textures and takes this into some powerful exploration from there. After the four minute mark this twists into some serious weirdness. The cut works through a number of odd variants in a rather freeform ELP like way. Eventually that gives way to a piano movement that brings some real old-school jazz to this. ELP is a good reference point as this builds outward, too. Eventually this makes it way back to melodic prog before powering up to a more rocking jam. That runs through and gives way to a piano and voice movement that creates the basis for the next movement. Other instruments and more voices enter after a time, but more to emphasize and augment rather than change things. Drums start this. The group explodes into a hard rocking fast paced jam from there. This is rapidly shifting and changing. It's purely fiery prog rock excursion. The vocals join and we're into a tastefully twisted and unique jam. Mid-track this drops to a drum and fife kind of arrangement. It works outward to more of a playful folk prog thing as that section works through. Then organ takes over a little before the three-minute mark. A fast paced jam emerges from there that makes me think of Flash, but it doesn't last long, giving way to some more jazz meets old time music stuff. Then it explodes out into a powerhouse hard rocking prog from there. This just keeps evolving until it fades out to end. Acoustic guitar and flute start this number. It builds out on that basis with a real folk prog approach. The vocals come in over the top of that arrangement. There is a drop to just piano after the one minute mark. As the cut starts to build out from there it has both jazz and prog tendencies. It reaches a peak and then shifts to more of a fast-paced driving prog rock jam. Again, ELP is not a bad reference point, but the vocals bring more of an Association kind of thing to the table. The piece continues to change, though, working to a fast paced jazz oddity from there. Don't get too comfortable because this doesn't stay in any place for too long. Before the three-and-a-half minute mark, it's turned to another ELP-like jam, but that quickly gives way to more of a twisted carnival element as they continue to evolve this thing. This is the type of cut that's hard to keep up with in terms of describing all the changes. A false ending comes in around the four-and-a-half minute mark. That brings us to a mellow, slowly building section that calls to mind early King Crimson. This thing just keeps evolving, though, turning out to a hard rocking jam that eventually fades out to end the album. Odd chorale vocals open this, creating an operatic, soundtrack-like beginning to the album. It's a bit odd, but also quite dramatic and bombastic. That section holds the piece for the first couple minutes, perhaps a bit longer than is prudent. The cut turns toward harder rocking progressive rock from there. The vocal seems restrained, but also a bit pained. Some of the guitar fills on this make me think of Steve Howe quite a bit. There is a dark, hard rocking edge to this movement. After the three minute mark it shifts to a more traditional progressive rock sound for a triumphant sounding movement. We get some folk prog with gentle vocals beyond that. The number continues to evolve, working out to some rather playful folk styled music further down the musical road. Eventually that gives way to a different melodic prog jam as it shifts gears again. Fast paced jamming that's a bit harder rocking (and reminds me a bit of Flash) emerges beyond that. Then around the seven-minute mark it abruptly stops and we get a return of the operatic vocals. We're taken back into the opening hard edged section from there. That's punctuated with a guitar based break that seems part Steve Howe and part Flash. The piece continues by combining that with the hard rocking movement. Then there is another blast of operatic vocals as that ends. A melodic prog jam based on some tasty mellower guitar work emerges to move it onward. Eventually this works through some changes to take the track to its closing. Coming in with a rather gentle folk rock approach, this is decidedly constant and melodic in comparison to the previous number's changes and bombast. It has plenty of prog tendencies, and I love the violin, but this is really a mainstream folk-based arrangement. This manages to power up a bit, but is a much more cohesive and less crazed tune than the opener was. The first half of this cut has a lot in common with the previous one. While it's less traditional folk based, it has a real folk rock edge. There is a good balance between mellower and more rocking textures. I love some of the keyboard textures on this piece. There is a fast paced, more rocking movement that makes me think of Nektar to a large degree. I really love this track. It's so effective. Percussion opens this and holds it. About twenty-seconds in a violin enters bringing some world music to the table. Twenty-seconds or so later the musical themes we've heard so far are brought into the electronic zone with keyboards working along the lines. There is a real Celtic edge to it. The cut shifts out after a bit to more of a powerhouse melodic prog jam that is hot. The drums drive like crazy along the road. It shifts to a bit less intense progressive rock excursion from there. Some world music melodies dance across. Then this turns a sharp corner to a movement that has an almost fusion meets symphonic prog approach. This thing continues to shift and change. There are some parts that make me think of Nektar a bit, but other elements call to mind Yes. All in all, this is just a rapidly changing and effective classic prog piece. It has a good balance between mellower and more rocking sections. It's actually amazing how much they pack into this piece given that it's less than six-and-a-half minutes long. A mellower movement brings this into being. The first vocals come in over the top of that backdrop. It's atmospheric and artsy. A fast paced jam explodes out from there as the first change of the cut. Another fast line of sound is heard before it drops back down, but not as far as before. The cut gradually builds outward to soaring melodic progressive rock as it continues. I'm reminded of Nektar a bit again on this next movement. They shift to a jam that features a fast paced rhythm section along with some jazzy guitar and flute over the top. The number just keeps getting rearranged. There is a faster paced section that has both some hints of psychedelia and more of that Nektar texture. Some guitar fills and twists and turns later make me think of Flash. A jam around the five-and-a-half minute mark has some hints of playful world music. There is a weird almost spoken vocal on the outro section here. While it's odd, it works well. Some cool bass soloing opens this track with class. The number works out from there with trippy jazzy explorations. Then after the minute-and-a-half mark it explodes into a powerhouse, tastefully off-kilter jam that has a lot of that jazz element at play. The track keeps shifting and changing as it drives onward from there. This thing encompasses a lot of different flavors and modes along its journey. This instrumental (there are some voices more as instrumentation on the outro) is dynamic and powerful. There is a short burst of fast paced progressive rock goodness. The track drops to just keys from there. Then we get the return of that blast, and more keys after. The first vocals come in over the top of those ambient keys, feeling a bit like Genesis. As it explodes out from there I'm reminded of Emerson, Lake and Palmer a bit. The cut continues evolving with sections that call to mind acts as wide ranging as Nektar, ELP, Yes and Gabriel era Genesis. I love the powered up prog jam after the two-minute mark that has a lot of Yes built into it. This just keeps growing and evolving and always entertaining. After a vocal only line, we're taken out into a different jam that's a bit slower and quite cool. I love the shifts and changes that ensue. A more melodic prog number, the Genesis comparisons are valid to a large degree because the vocals make me think of Gabriel. I really dig some of the intricate guitar work on this piece. This number is a lot more constant than the opener of this disc was. It's quite effective, too. There is a fast paced section that comes in around the half way mark, with the piece gradually speeding upward. Then it explodes out for a killer jam with some smoking hot instrumental work featuring different instruments including flute. The powered up, intense, fast section serves as the backdrop for the next vocals of the set, and makes up the bulk of the second half of this. It drops around the seven-minute mark to a mellower movement that carries the track from there instrumentally and quite effectively. We're into fast paced prog jamming on this thing. I dig the keyboard dominated sections on this a lot. This is a powerhouse, but it's also a fairly consistent and straight-line piece. It doesn't really call to mind anyone except PFM. While the first section of this is a mellower, more reflective movement, that doesn't mean that it's lacking in musical virtuosity. There is some amazing work on this number. It maybe be more textural in terms of overall vibe, but the band really put in some impressive playing. They power it up at various points along this ride. In some ways, particularly the vocals, this is another that makes me think of Genesis quite a bit. The faster paced stuff further down the road lends a different side to the cut. It never wavers in terms of musicality, though. Additionally, they drop it back down before the seven-minute mark for a return of the mellower textures. Keyboards bring this in with a mellower motif that seems to imply much greater things. As the vocals join, organ takes over. There is a bit of a gospel vibe to this early section, but I can make out hints of Genesis here, too. It continues in this mode for a time. Eventually flute comes over the top as some synthesizer also paints musical pictures. It's not until around the three-minute mark that other instruments join. The cut powers out from there to a rocking jam that reminds me just a bit of Kansas, but the violin probably has a lot to do with that. As the vocals return it seems to me think of what you might get if you mixed Nektar with Genesis. It drops to a mellower movement around the four-and-a-half minute mark and violin brings some drama as it starts to work forward from there. It eventually makes its way back to the harder rocking movement as it continues. The cut resolves from there with style. Acoustic guitar opens this album in style. In fact, this opening piece is a solo that works through a number of changes and modes along the road. It's impressive, but more importantly, it's effective. The title track comes in with a rather strange and jarring movement based around a vocal performances. It works out after that segment to some killer jamming that has a definite fusion vibe. The cut continues to evolve and grow from there, working through all kinds of cool territory. I really love some of the jamming on this thing. The cut has some funk built into it along with more pure progressive rock and the aforementioned fusion. This is a real powerhouse track on this movement. It drops back to a bit of a false ending later. It rises out from that point mellower with a keyboard based arrangement, again feeling rather fusion-like. The vocals that come in make me think of Gabriel again. This eventually makes its way to another killer fusion instrumental jam. The Gabriel-like vocals come in over the top of that as this number plows forward. At over nine-minutes of music, this is a mini-epic in size and scope. Tasty keyboard textures bring this into being. As it works outward from there it has plenty of mellow fusion in the mix. The keyboards really drive a lot of this number as it continues. There is some noteworthy bass work, too. This instrumental is a melodic piece that does a great job of merging progressive rock and fusion with style. With both funk and fusion in the mix, this powers in as an up-tempo rocking tune. I dig the violin soloing on this thing. The cut is a real powerhouse jam with some interesting changes and modes. Violin opens this and holds it for the first minute-and-a-half or so. The cut works out from there with other instruments joining to drive things onward. It rocks with a lot of fusion in the mix. As the vocals join they bring a different flavor with them. They are in Italian. The cut is another solid prog composition. Electric guitar brings this in with a bit of a bluesy guitar vibe. As it works out from there this takes on some definite fusion textures. As it approaches the three-minute mark it seems to end. Instead a new, more intense, fusion jam emerges with the bass really driving it. That section holds this instrumental for the remainder of its length. I love the bass work on this. Another fusion-based cut, there are definitely things about this that make me think of Frank Zappa at times. It's well after the minute-and-a-half mark before the vocals join. The cut drives onward from there with the singing making me think of Gabriel merged with Iron Butterfly's Doug Ingle. Coming in mellower, dramatic and powerful, this builds out with a lot of style. As the vocals enter, I'm again reminded of Genesis to a large degree. The melodic guitar soloin around the two-minute mark is classy, and this piece builds nicely. Around the five-and-a-half minute mark it drops way down to a mellower motif to continue. It carries on a bit mellower, but works out after a time to a more powered up movement. It has some killer jamming and musical texture built into it.